EnviTec Biogas is Europe’s leading manufacturer of biogas plants with an installed capacity of more than 385 MWel. EnviTec Biogas covers the entire value chain for the production of biogas, including the planning and turnkey construction of biogas plants and biogas upgrading plants as well as their commissioning. The company takes charge of biological and technical services on demand and also offers full plant and operational management. 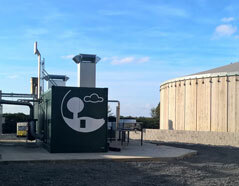 In addition, EnviTec also operates its own biogas plants. Active in 17 countries, EnviTec installed more than 470 plants worldwide and has a wide experience in processing agricultural, agro-industrial by-products and other organic waste. In 2016, EnviTec generated revenues of €162.9 million and an EBIT of €4.2 million. The EnviTec Group currently has around 460 employees. EnviTec Biogas has been listed on the Frankfurt Stock Exchange since July 2007. In addition to its competence and experience, EnviTec attributes its outstanding success to its commitment to innovation and progress. From the very beginning we concentrated on a modular construction concept, and thus early on we were able to handle plant sizes from 370 kWel upwards. We have also been known for our pioneering work in the development of new technologies for some time. For example, this applies to effluent treatment but also to biogas treatment. These processes and other innovative processes are further developed in our research and development department. As biogas-allrounder, we cover the entire value chain for the production of biogas - and this since 2002! Innovation 'made in Germany': With our technological know-how we set standards in the industry. We bring out the best from your plant and assist with our expertise. Around the clock. Japan, USA and Italy - worldwide we enjoy the trust of our customers and score with competence and quality. EnviTec Biogas AG is listed on the Frankfurt stock exchange since July 2007. The strong background of the EnviTec group offers financial reliability to investors, clients and partners. Qualified, dedicated and reliable: Our employees are our potential for sustainability! Being a fully integrated biogas solutions provider, we have maintained our position in all four business divisions thanks to our sustainable company concept, dedicated employees and our customers. Therefore, we feel that we are well-armed for the future in the biogas market with the support of our own plant, plant erection in foreign countries and a wide portfolio of services and direct marketing. EnviWaste - Generate value from waste with biogas! Every farm or food enterprise generates by-products which are eminently suited to biogas production. The targeted utilisation of organic waste can help generate energy and heat. Each waste material requires special treatment, hardly any two industrial operations function in the same manner, all communes have their own characteristics and each country has its own raw materials and laws – the highest degree of flexibility has always been a pre-requisite in our domain. Our goal is to make sure you get as much as you can out of the collaboration, offer the most progressive technology on the market and deliver the smartest marketing concepts for your energy. Consequently, we have consistently managed to occupy a leading position in the global biogas sector. Our EnviWaste technology + experience = facilitating successful investments! Our field-tested EnviFarm biogas plants offer you a flexible choice of input materials, and are tailored individually to your business and your specific requirements. As an alternative to being run as slurry-only plants, you can also operate them with biomass or with any type of organic waste. The stable and spacious technical building offered by an EnviFarm plant allows optimum temperature control with innovative ventilation technology, plus weather-independent operation and storage. EnviFarm is equally impressive in its compact version (plant output from 75 kWel). The modular, container-based format means EnviFarm can be installed as a compact plant that makes the most of available space. Whatever the model, all our biogas plants have one thing in common: impressively high efficiency and maximum profitability. We help you when it comes to the daily operation of your biogas plant. Our highly qualified staff of technical and biological service are available twenty-four-seven.